If I’m being honest, I’ve been pretty disinclined to run lately. I’m sure once I list the reasons, they’ll sound like excuses to you and to me, but the fact remains that I just haven’t been feeling it. 2. Thanksgiving: Yes, I realize those events were a month apart but that doesn’t stop me from using Turkey Day as a reason not to run. Once we decided not to do the local Turkey Trots, I just didn’t have much in me to get out there. 3. Rain: We’re in a massive multi-year drought here in California. While it’s a frightening situation, it’s also been a little tough to complain because who really LOVES rain anyway? Well, apparently Mother Nature isn’t loving our dry climate so we’ve gotten some great rain lately. While I love to hear it on the rooftop, I don’t love going out in it. I don’t really mind running in the rain but I’m also not super motivated to do so. 4. Family Drama: We’ve had this in spades lately. Post-Thanksgiving the fall-out from the big day just drained me and I didn’t feel like getting out of bed, let alone putting on running / rain gear and hitting the muddy trail. A few weeks ago (2 actually), my gorgeous friend Esmeralda asked on Facebook whether anyone would be willing to be a Running Buddy for her Girls on the Run team. Other mutual friend, Rebekah, and I were both in! Esma was coaching the team at a local elementary school and was looking for volunteers to run along with the girls on her team. If you’re not familiar with GOTR, you should be. 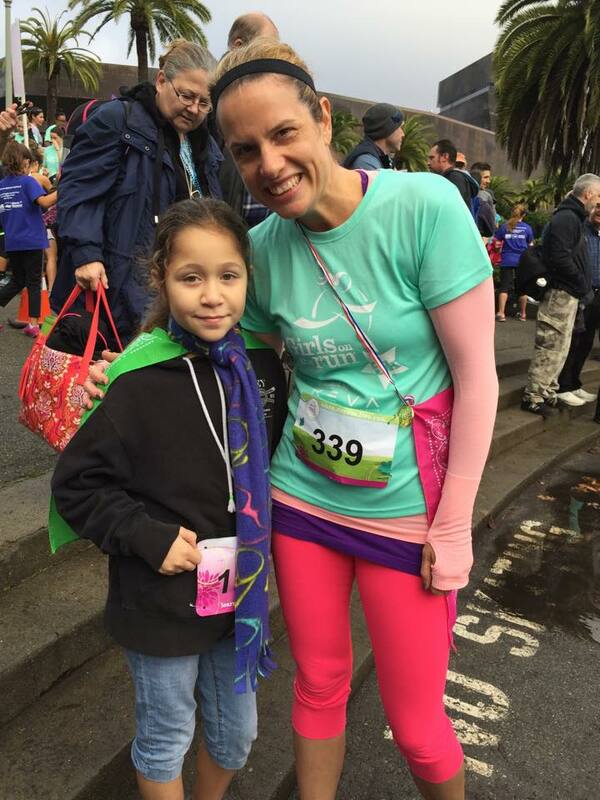 GOTR is an awesome nonprofit that brings running to 3rd-5th grade girls. The girls train with local volunteer coaches in their elementary schools for a few months and then finish their season by running in an untimed 5k. Here in the Bay Area, the event took place yesterday in Golden Gate Park in SF. 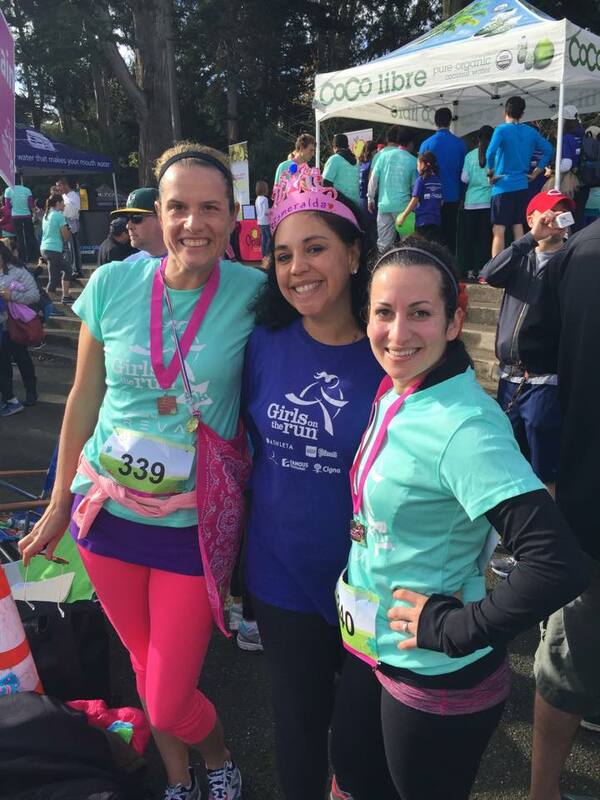 Here we are…me, Esmeralda and my girl, Rebekah…strutting our stuff post-race. Can you believe they gave ME a medal? I was amazed – after all, I am the one who was honored to get to be there! If you can run 3 miles, you can be a Running Buddy and the whole experience is beyond fun. And no, you don’t have to be a mom or even a woman. There were plenty of dudes out there running with the girls. I particularly loved the Daddies running along with their girls carrying pole-mounted GoPros capturing the whole thing. How sweet! Esmeralda assigned me to a sweet little girl. She is the very quiet middle child in a family of 4 daughters. Her mom couldn’t be there yesterday because she was working but I KNOW she would have made her Mama proud. She ran like a little champ. We chatted a little during our run (I mostly chatted to her and asked her questions, to which she responded with very short answers) but mostly we just stayed together and navigated the enormous crowd of runners. I was in little girl running heaven. Here’s my cutie pie…my sweet little running champ. I would love to run with this kiddo again. So this morning, I grabbed my running shoes, pulled out my RUN LESS, RUN FASTER app and got in the car. I was at my mom’s house in Sacramento last night so I thought a run along the American River Parkway trail would be perfect. It slipped my mind that the California International Marathon was happening this morning. The street I’d need to cross to access the river trail was the main race route. I couldn’t cross it so I parked about 3/4 of a mile from the river trail and did my pre-run stretching while watching the runners pass. Seeing those sweaty, tired and motivated runners this morning flipped a switch in me. I hit the trail and ran the 8-miler prescribed in my training plan. It was tough, I won’t lie. Getting back to a running regime when you’ve skipped out on several weeks of consistent running isn’t easy. It is NOT easy. But I powered through it. And I remembered what all those 8-10 year old girls I saw yesterday already know. Running is awesome and it makes me feel powerful, capable and strong. I fell in love yesterday! With Girls On The Run. Thank you Esmeralda and Rebekah! !